Dr. Micah Goodman, a liberal Orthodox scholar of Jewish thought (i.e., a believer in religious pluralism), has ventured into Israeli politics and the Israeli-Palestinian conflict with his latest book, Catch-’67: The Left, the Right, and the Legacy of the Six-Day War. He is also a Research Fellow at the Shalom Hartman Institute of North America, under whose auspices he appeared in New York on Nov. 27, to speak about this book. He laid out the perplexity of most of the Israeli electorate, which he describes as simultaneously holding “right” and “left” views, rejecting both the ultranationalist vision of a Greater Israel and the left’s hope for a lasting peace with the Palestinians. He sees the First Intifada (1987-’93) as having killed off the former for most Israelis, with the Second Intifada–coming as it did shortly after the Camp David Summit–dashing the dream of peace through the deadly impact of the suicide bombers. I found this depiction of the prevailing Israeli attitude to be persuasive, but I was disheartened that he personally shares it. For example, he voices the common (mis)understanding that Arafat was offered “everything” and ultimately rejected peace at Camp David, rather than the more nuanced understanding that all three participants (Arafat, Barak and Pres. Clinton) stumbled badly; the peace process was not dead until Israel withdrew from the Taba negotiations in January 2001, because Israel’s elections were around the corner and there was a certainty that the results would be disastrous. I wish that either Arafat had swallowed his objections (on the extent of Israel’s withdrawal, the status of East Jerusalem, and the fate of Palestinian refugees) and signed onto a peace deal; or, that all three parties had announced progress in the talks with further negotiations planned to finalize a deal in coming months (Taba is said to have come much closer to an agreement than Camp David). Arafat can be blamed for poisoning the atmosphere for peace with inflammatory rhetoric and a degree of complicity with the Intifada. But he was also blindsided and humiliated at Camp David, with Barak ad-libbing proposals (such as establishing a synagogue on the Temple Mount) and not having properly prepared the way for the Summit in the first place, having ignored the Palestinians for a year while unsuccessfully pursuing a peace deal with Syria. Either Rabin or Peres would have approached the Summit in a more deliberate manor, and their rapport with Arafat would have been far better than Barak’s. 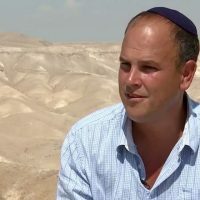 Israel’s “catch-22,” as alluded to in Goodman’s book title, is the dilemma that has evolved from Israel’s victory in 1967: that the ongoing occupation of territories populated by the Palestinians is harmful to Israel’s existence as a democratic and Jewish state, but cannot be ended in a complete and final peace (in his view) because of violent Palestinian rejectionism. Goodman advocates measures on the ground that would minimize the degree of occupation without substantially compromising Israel’s security. He understands that the lack of contiguity between West Bank cities–veritable islands of Palestinian autonomy within a sea of Israeli control–intensify the oppressive quality of Israel’s occupation. In this connection, he suggests that the Palestinians be given authority over roadways linking their towns and cities. (In fact, during Olmert’s aborted negotiations with Abbas in 2008, the then-prime minister proposed a tunnel under the E1 highway between East Jerusalem and Ma’aleh Adumim, to connect Palestinian areas to the north and south.) He also advocates a freeze on expanding settlements. Yet Goodman astutely realizes that Netanyahu’s rightwing coalition is incapable of implementing measures that would ease the occupation, and he proves this by citing one such failed effort. He relates how a proposal to expand the boundaries of the Palestinian city of Qalqilya, to allow for the expansion of housing stock for its growing population, went up the chain of command from a local IDF commander to the IDF chief of staff to the defense minister (Avigdor Liberman at the time) to Prime Minister Netanyahu, with each echelon approving the idea until Jewish Home party leader Naftali Bennett got wind of it and raised a stink. Then Netanyahu denied ever approving it or even knowing about it. For Goodman, this perfectly illustrates how Netanyahu has no principles or scruples beyond remaining in power. A June 2017 NY Times article, “A Best-Selling Philosopher Examines His Country’s Inner Conflict” discusses him in relation to last year’s Hebrew-language publication of Catch-67. He lives in a mixed religious and secular settlement, Kfar Adumim, near Ma’aleh Adumim, the West Bank’s third largest settlement, but says “I would rather not be called a settler. It’s where I live, not who I am.” During his talk, he mentioned the little-discussed decision made by Rabin in the 1990s to build roads that bypass Palestinian villages and cities; this allowed settlers to travel without entering Palestinian population centers, with the “unintended consequence” of encouraging non-ideological Israelis to move to the West Bank to improve their lifestyles, greatly expanding the settler population. I’m guessing that this policy decision had personal significance for Dr. Goodman’s family. Goodman’s an entertaining and charismatic speaker in virtually unaccented American-English (his parents immigrated from the United States). I don’t doubt his goodwill and appreciate most of his insights, but I do not believe he’s fair in basically equating the “illusions” of the left and right. Believing in the possibility and necessity of peace is very different than denying another people’s right to self-determination, depriving them of civil rights and stealing their property. But I’m inclined to agree that the rhetoric of the left is now more about ending the occupation than achieving a peace agreement. Dr. Goodman is the latest in a growing list of Israelis staking out the center, such as his colleague and mentor Yossi Klein Halevi and politicians like Yair Lapid. The extent to which his and their ideas as centrists can engage Palestinians in at least a modicum of peace (if not a final agreement) is an open question. Lapid doesn’t seem to want to try; not being a politician, Goodman may be more open-minded, but he’s not a decision-maker. It is unfortunate that while supposedly reviewing a book and stance of a writer and thinker (Mr. Goodman) the writer has brought his own false, inaccurate, and agenda riddled opinion in to “proove” a point. Pure politics. Shame.